Product information "MIIC-208 iPort/USB 2, USB to I2C Host Adapter with Circuit Sense"
In addition to being our fastest I2C Bus host adapter, the iPort/USB 2 introduces Circuit Sense, our switch-selectable I2C Bus voltage-sensing technology. Circuit Sense gives the iPort/USB 2 the ability to dynamically sense the operating voltage of your circuit and constantly adjust the iPort/USB 2 to match the logic voltage levels set by your device and circuit. With a logic high I2C Bus voltage range of 0.5v to 5v, Circuit Sense allows the iPort/USB 2 to work with the widest supply voltage range of devices available. 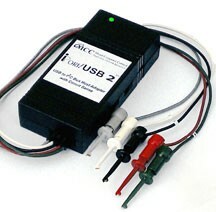 The iPort/USB 2 is one of several I2C Bus communication solutions available from MCC. To find out more about our complete line of I2C Bus solutions, click the link below. • USB Bus Powered with USB 2.0 Type B Jack. • Built-in ESD, Over-voltage, and Reverse-voltage Protection. Related links to "MIIC-208 iPort/USB 2, USB to I2C Host Adapter with Circuit Sense"
Customer evaluation for "MIIC-208 iPort/USB 2, USB to I2C Host Adapter with Circuit Sense"